Lee bought a shirt at Bistro B. The place, as always, was packed. We waited for a few minutes, which I enjoyed. I stood by the little altar with the burning incense spiral, the electric-powered prayer wheels, and the little shrines decorated with offerings of change. I looked around at the tables to see what other folks were ordering. There were a lot of butane portable table burners heating hot pots that were being shared by a whole family – three generations or more – packed around the big round tables. I love watching a family eat, the heads bent, concentrating on the food, with a ballet of chopsticks dancing in a circular chorus while everyone picks up their food, talks, and laughs. We were earlier than we usually were – so the place wasn’t completely packed. The menus were new – the numbers only going up to 494. And in the last six years the restroom extravaganza has been toned down more than a bit. As always, the Christmas-day service was a little rough. There is a new “Taco” section in the menu – Candy ordered one of those. “Oh, I’m sorry, that’s new, we haven’t learned how to cook those yet,” was the answer from the waiter. Candy ordered chicken, Nick, Lee, and I ordered Pho. 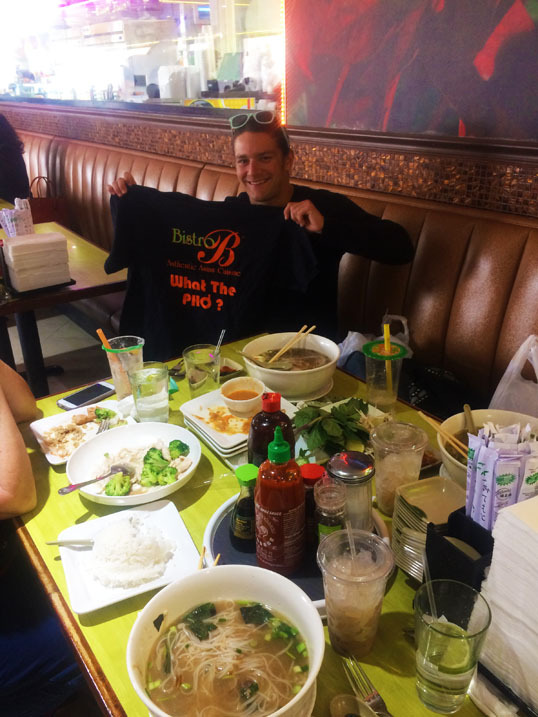 The chicken arrived quickly, but no Pho. A while later, the waiter came by and asked how everything was. 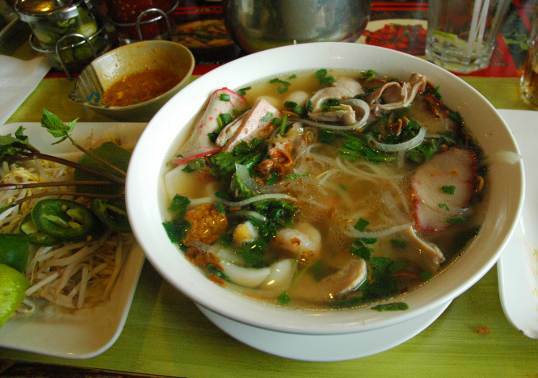 “No pho,” we answered. 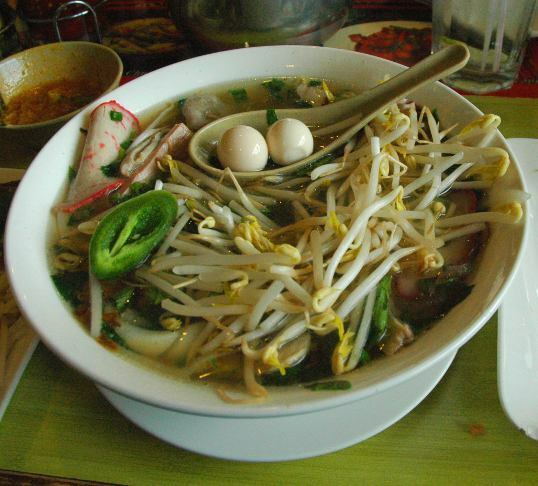 He looked flustered and our three enormous bowls of soup came out in a minute. That’s cool – usually we don’t even get what we order – a busy place with a book for a menu and 494 items – you have to chill a bit. My soup as it arrived. What mysteries await in these warm waters? After our food we drove across the city for our second Christmas Tradition – to see a movie. It’s getting so that we will only see films at the Alamo Drafthouse (their no phone-no talking-no arriving late or you will be thrown out is a game-changer) and we took in I,Tonya at the Alamo in the Cedars. 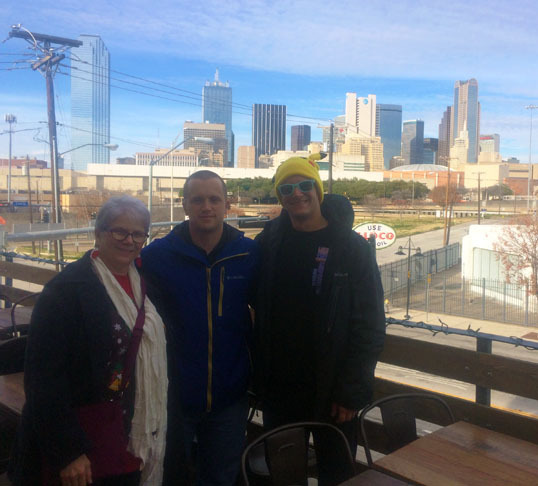 They have a nice bar upstairs with a killer view of downtown Dallas. A nice way to wile away a Christmas day. 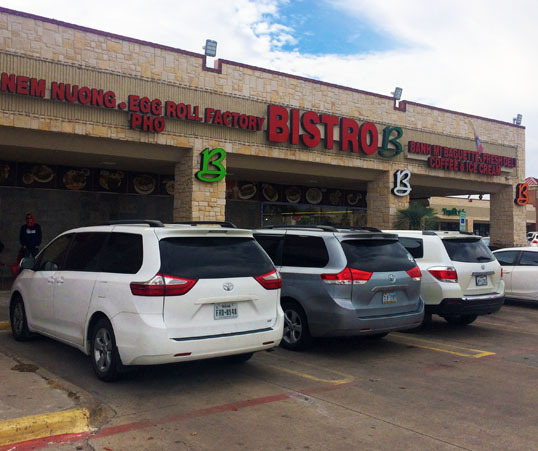 A while back, I read an article from the Dallas Observer called, “Two of Texas’ Best Vietnamese Sandwich Shops Share a Garland Parking Lot.” It told the story of Quoc Bao Bakery and Saigon Deli. Two of the best banh mi shops in the region — arguably two of the best banh mi shops in the United States — make their homes in Garland, where they stare each other down across a shared parking lot. Just one suburban stretch of asphalt apart, Quoc Bao Bakery and Saigon Deli compete for the title of best banh mi in metro Dallas. But I wanted to know: Which one is better? The answer is not so simple, of course. 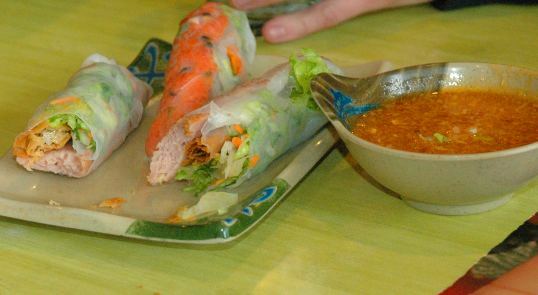 Quoc Bao and Saigon Deli are equally great but for different reasons, and any diner’s preference will depend on taste. It all boils down to the fundamental question which professors in Dijon-stained tweed jackets ask on the first day of Sandwich Philosophy 101: Which is more important to the sandwich, really great bread or really great filling? A quick check of the map confirmed what I had already suspected – the aforementioned parking lot was at Jupiter and Walnut – three miles of residential streets including two miles of dedicated bike lanes. Perfect bicycle riding distance. So I rigged my folding bike for hot summer riding (the temperature was flirting with triple digits) which means I filled a half-gallon Nalgene bottle with ice and water, enclosed it in an insulated cooler that fit it tightly, and clipped it to the crossrack on the back of the bike. Despite the heat, the ride down wasn’t unpleasant at all. I had been tracking all my rides with a phone app and keeping my average miles on a spreadsheet I devised. However, recently, I have been studying a short book The Bicycle Effect: Cycling as Meditation by Juan Carlos Kreimer. It has me thinking more and more of cycling as a mindfulness exercise as well as a means of transportation. I have embraced being the world’s slowest cyclist and putting aside goals of distance and speed – other than the obvious need to make sure it is possible to get where I want to go. I chose Saigon Deli for my first visit, for no particular reason. Will have to go for the bread at Quoc Bao Bakery next time. The store was bright, cheery, and clean. 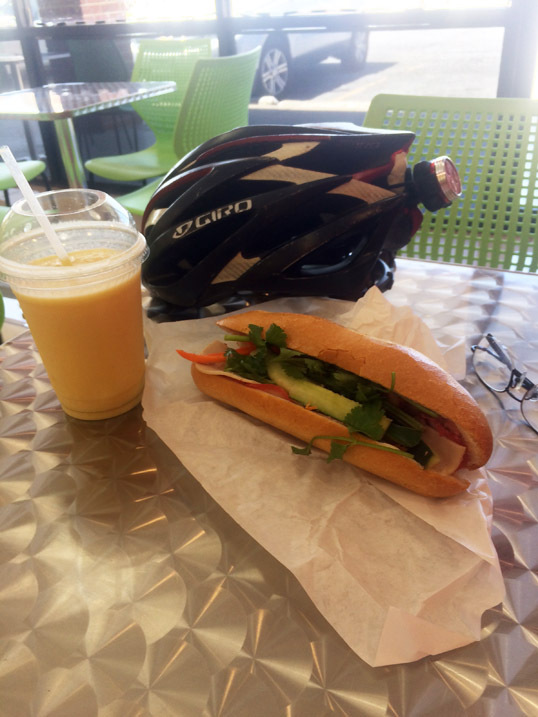 I ordered a #1 combination sandwich ($3.50) and a Mango Smoothie (also $3.50). It was very good. Best in the world? Best in Garland? Best in the parking lot? We’ll see. It was worth the bike ride in the heat though, and that’s all that’s important. I’m not a big fan of holidays. Especially the manufactured holidays, like Mother’s Day, Father’s Day, Earth Day, or any of the others that arise not out of ancient pagan fertility rites but more modern constructions of the retail-industrial complex designed to make people go out and buy stupid presents – spend their hard-earned cash on superfluous consumer tripe rather than save it so it can be eventually lost in bad investments – like it should. Now, I’m not complaining about my gifts, mind you. I may be stubborn, but I’m not stupid. Candy gave me a very nice pen – I’ll take some photographs in a few days. Still, I didn’t really want to celebrate – fight the lunch crowds – and said I’d eat some leftover beans instead. OK, I live in a Texas Suburb. Those of you a long way away probably are now thinking of big slabs of grilling beef and people wearing boots and ten-gallon hats. Those of you a little closer are thinking about typical American Mall fare – like what?… Cinabon, Steak Escape, Orange Julius (are these still around?) Dog on a Stick? – Jeez, I have no idea what a mall has in its food court anymore. At any rate, that’s not what I’m talking about. This may be a boring Texas Big City Suburb, but the world is a much more diverse place than you think it is. 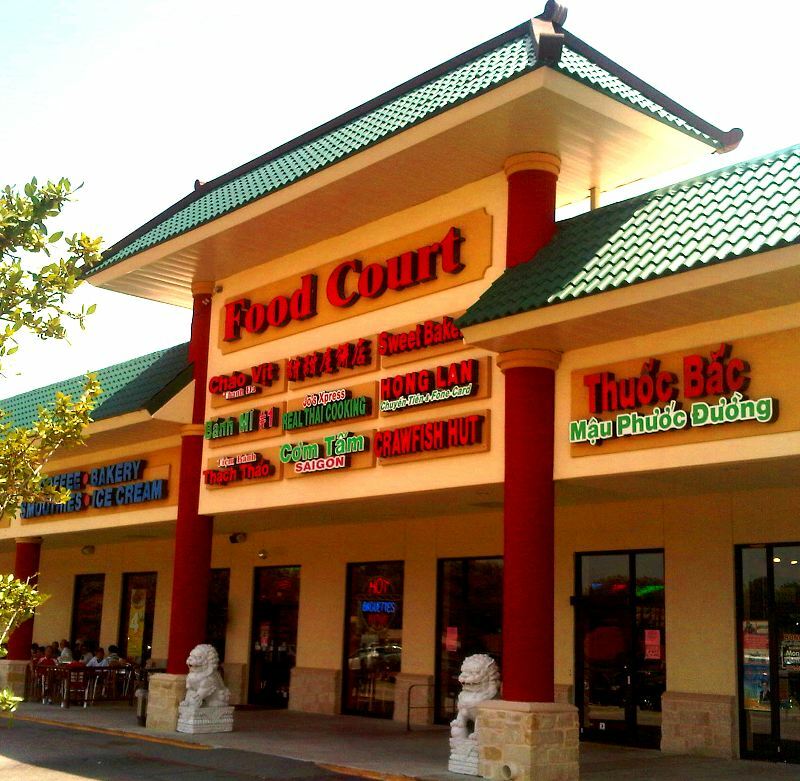 My neighborhood mall is the Saigon Mall, a Vietnamese-Oriented complex constructed upon the carcass of an extinct Target, and its Food Court is a place of strange and wondrous sustenance. My only disappointment is that the self-serve frozen yogurt place is gone. I’m going to have to find another place for my Durian ice cream fix now. Candy has a Cuisinart Ice-Cream maker… maybe I could make my…. no, better not. Durian preparation is probably something best left up to professionals. We walked around a bit and examined the various purveyors of various cuisines – Lee was close to getting a pound of boiled crustaceans from the Crawfish Hut, Candy looked at a new stand that promised “Real Thai Cooking”, and I considered some Pho – but we eventually decided on sandwiches from Lee’s – an always reliable and delicious choice. 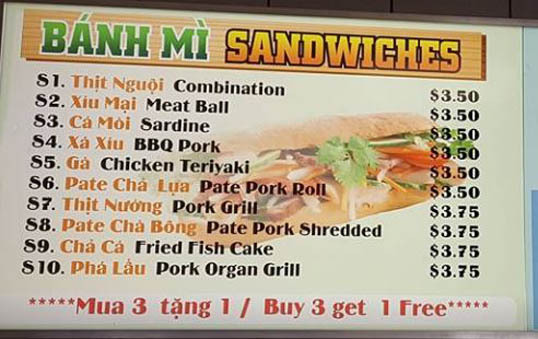 When ordering sandwiches, I tend to get the #1 combo – no matter what is in it. They have decided to put this at the top of their menu and they know better than I. 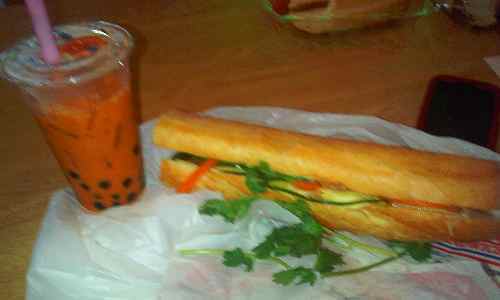 My Sandwich - #1 combo with Thai Iced Tea. My sandwich was not as blurry as this picture suggests. The fresh cilantro and other herbs along with the crunchy fresh-made baguettes really set these apart from the usual boring sub fare. There was some sort of very hot pepper hiding inside somewhere, I needed another tea. You can see the Boba in my tea – it was very good, though I have no idea what was in it. After we had our sandwiches, we went down to the Boba Tea/Smoothie place. We always love this spot. Lee and I love Boba but Candy says she “doesn’t want any of those little snot-balls” in her beverage, which I can’t really argue with. The place used to be called Teahouse, but it has a new logo – “I (heart) Boba” – though the menu seems pretty much the same. The menu consists of a list of pretty much every substance on earth – thrown into a blender with either tea, ice, or some sort of “cream” mixture. I felt like coconut, which was number 114, and the list went on from there for a long way. Then you can get Boba, or Gummy Bears, or anything else, really, dumped in for extra amusement. I felt like some “snot-balls” today, so I had Boba. 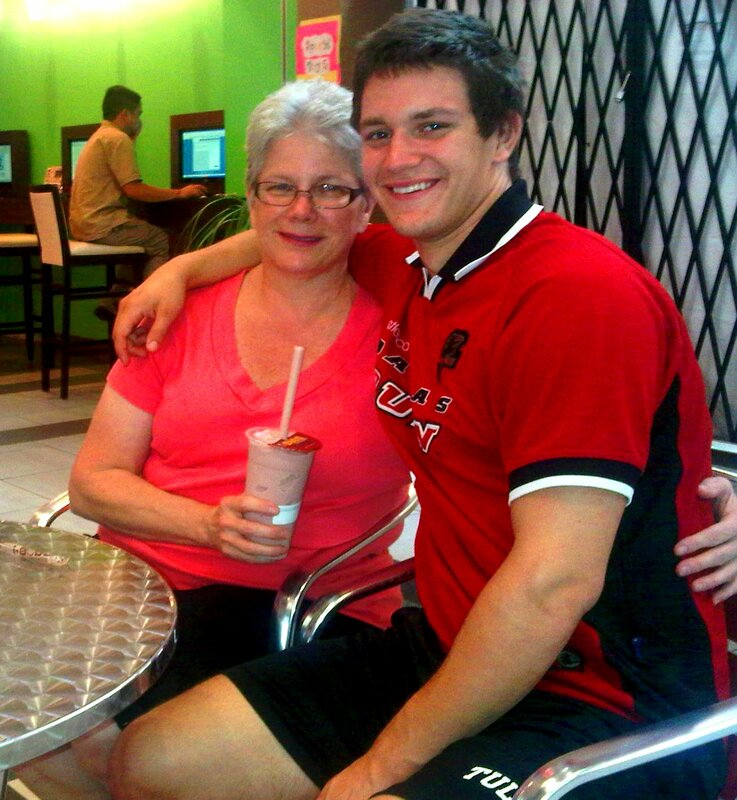 Candy and Lee enjoying their smoothies. 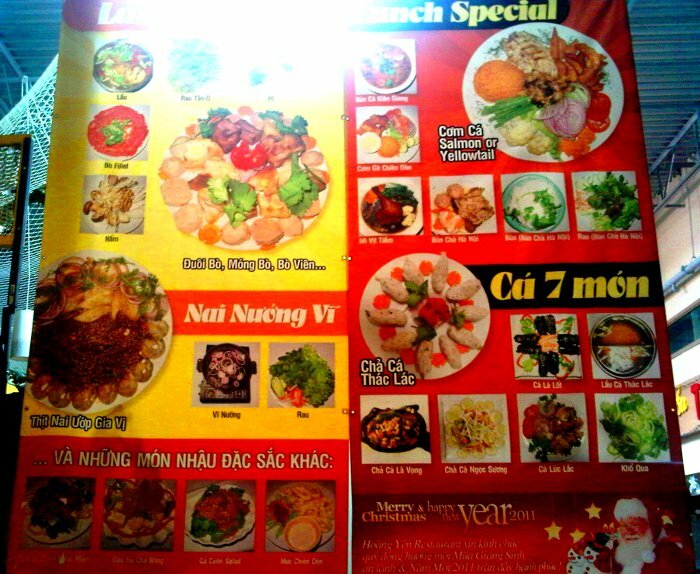 Here’s the giant lunch menu outside one of the several restaurants in the Saigon Mall. I don’t want to sound like some ignorant American Redneck, but my honest reaction to this is, “What the hell is this stuff?” I see some shrimp arranged in a nice, attractive circle, but it surrounds some strange looking brownish sauce with white flecks – it looks like it might be too spicy, even for me. One dish is labeled “Salmon or Yellowtail” which is reassuring, but nothing in the picture next to it resembles fish in any way. I hate the feeling when you order something at random and the waiter’s eyes get big and that concerned look crosses their face. They will shake their head from side to side, and say, “Oh, you don’t want to order that.” Sometimes I’ll stubbornly push ahead and insist, eagerly waiting until the plate of something arrives and is set down in front of me. You know, those waiters are always right. I should listen more often. Oh, I stumbled across this… Here’s something you should NEVER, EVER do in a mall food court.